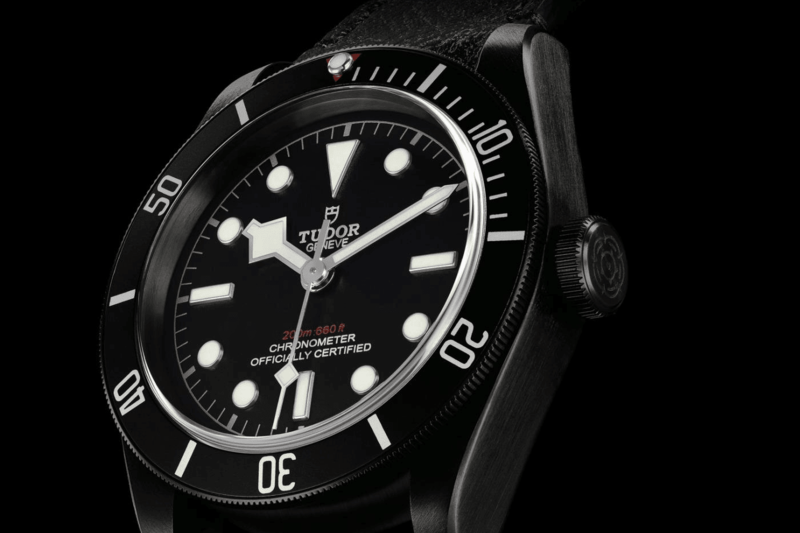 A new addition to the Heritage Black Bay family has been released by TUDOR, the Heritage Black Bay Dark offers the same historic style of the traditional TUDOR diving watches but with a modern design. The Heritage Black Bay Dark inherits the primary lines, along with the domed dial and crystal from the first TUDOR diving watches. The new watch features a prominent winding crown from the renowned 7924 model, known as the ‘Big Crown’; along with the angular hands borrowed from an earlier edition of the watch known as the ‘Snowflake’. In addition to this, another key historic design feature reappears in this new model with the guaranteed water depth indication engraved in red on the dial and the red triangle on the rotatable bezel- two essential features for all divers. The distinctive features of the Heritage Black Bay Dark focus on its 41mm wide steel, covered with an innovative PVD (Physical Vapour Deposition) treated coating, formally developed by NASA which allows almost any non-organic material to be bonded with metals. The new model comes with an entirely satin finish, increasing its resemblance to a piece of black military utility equipment. The Heritage Black Bay Dark harbours the first mechanical movement in the brands history to have been developed, manufactured and assembled in-house in 2015, known as the Tudor In-house Movement MT5602 . It displays hours, minutes and seconds, and holds the reference MT5602 in which ‘MT’ stands for Movement Tudor; it’s high performance caliber offers a 70-hour power reserve allowing its user to go days without having to wind it. With a frequency of 28,800 beats/hour or 4HZ, the movement it is managed by a variable inertia oscillator with silicon balance spring, kept in place by a traversing bridge- showing its impeccable strength. The new model comes with the option of a black PVD-treated steel bracelet or an aged leather strap with a back PVD- treated steel folding clasp, as well as an additional grey fabric strap. A signature feature of the Tudor Heritage line, these straps are made in the Jacquard techniques following traditional methods founded by a hundred-year-old family business from the St Etienne region of France. The new editions to the Heritage line bring together the designs of the past, present and future to ensure their designs stay on top of the trends.